LEVERINGSTID CA. 2-3 UGER FRA BESTILLING. 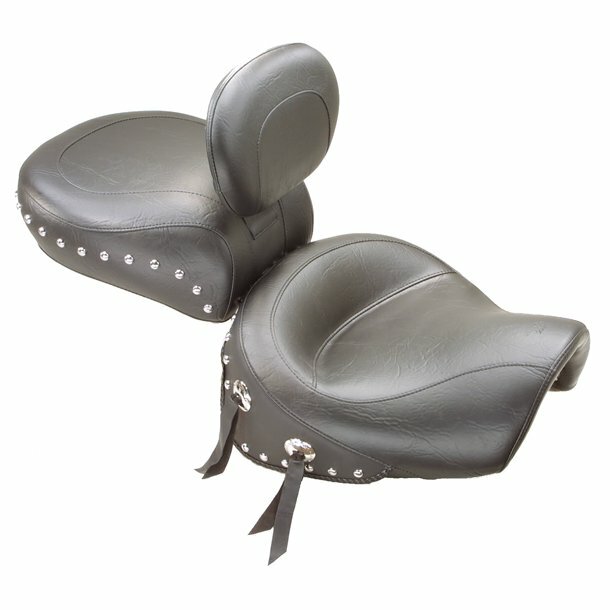 Sold as a complete three-piece set including solo, passenger seat and removable driver backrest. A 16" wide front solo seat sets the driver back for the ideal cruising angle. Back support is provided by the nose of the matching passenger seat that extends forward to create a full 8" high backrest. The passenger sits comfortably in a 13" wide bucket that is supported by internal steel support wings to prevent sagging around the edges. Chrome mounting brackets are included. The driver backrest mechanism is built directly into the passenger seat--not into the solo. Note: Mustang seats will fit with Cobra brand Luggage Racks or Kawasaki Fire & SteelT #K53020-066C if rear seat tab is mounted on top of luggage rack.